These documentary DVDs testify to the mighty move of the Holy Spirit underway right now across Africa. Witness the extraordinary results of Reinhard Bonnke's gospel ministry to millions hungry for God! 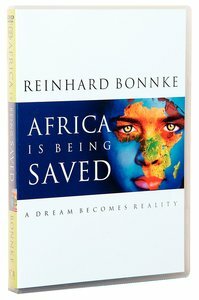 About "Africa is Being Saved"
The son of a pastor, Reinhard pastored a church for two years and then started missionary work in Africa in the early 1980s. He began holding meetings in a tent that accommodated just 800 people, but as attendance steadily increased, larger and larger tents had to be purchased, until finally, in 1984, he commissioned the construction of the world's largest mobile structure a tent capable of seating 34,000 people! Soon, attendance at his meetings exceeded 150,000 people per service! Since then he has conducted city-wide meetings across the continent with as many as 1,600,000 people attending.